Notes Her yesterdays are behind her. The fading memories of a changed existence, which she's shed like a second skin - but in reverse. Stepping into flesh, and letting the soul settle into the body. Her memories of her old life are murky, and hard to grasp, so she's let those memories slide from her grasp and steps forward to make new, tangible, memories. She has eyes made of unblinking stone - a mark of her kind, that she'll recognize in other Virals just as they'll recognize it in her. 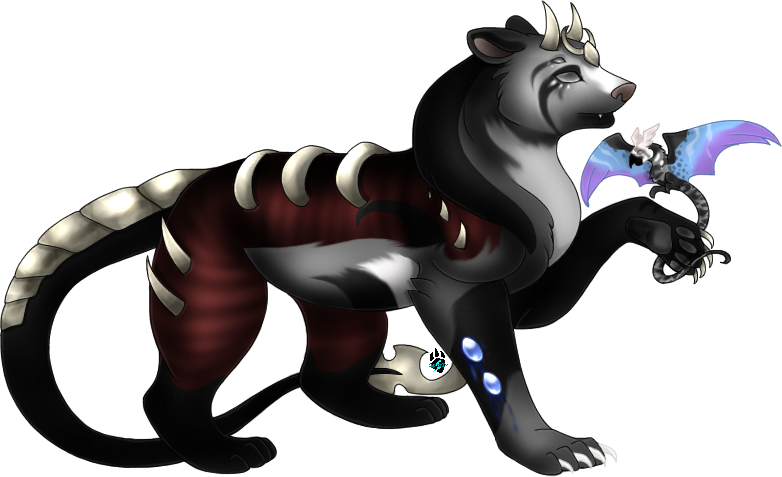 She has the form of an Orias Numa, but has traits that mark her as unusual. A long reptilian tail, and bone that grows on the outside of her body. She has glowing blue orbs embedded in the flesh of her right leg, which bleed blue whenever she moves. This is perhaps not too unusual; it's a trait she stole from a Numa. Another female Viral, Pyika, acts as a companion; it took traits from a Mimic and an Aggressor Demon, and ended up in a small body. Like her, she has unblinking stone eyes. While she can talk, her voice is quiet, her vocal chords unable to raise too high. She sticks close because she's not strong; she can fly, but lacks any attacks or powers to defend herself.